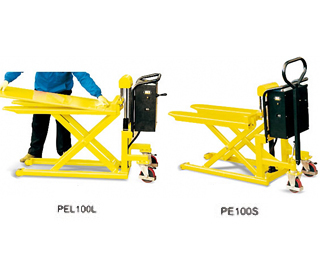 Electric Skid Lifter PE/PEL series. Easier handling to minimize back strain. Better feature - it can move when raised. Continuous-welded heavy steel frame and forks handle weighty loads with ease. Easy-to-use control lever plus two parking brakes on steering wheels increase safety. 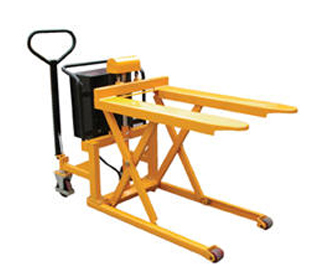 Reliable power unit for easier and faster lifting. 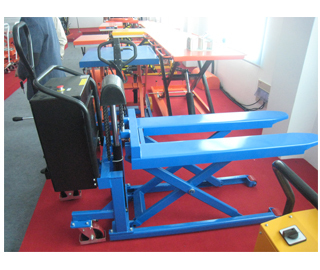 Additional steering handle on 1000kg models for easier and more comfortable turning. Conforms to EN1757-4 and EN1175.